Before beginning with uninstall procedure make sure that you moved everything away to new servers (Mailboxes, OAB generation,…)! Login to pasive node and check whether Exchange CMS is located on active node with Get-ClusteredMailboxServerStatus cmdlet from Exchange Management Shell. 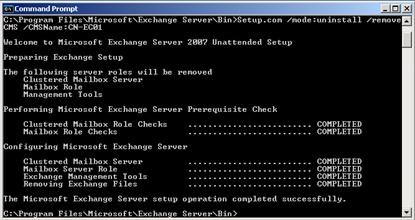 Open a Command Prompt window and change path to %ProgramFiles%\Microsoft\Exchange Server\bin. After the Cluster service has been stopped, evict the node by running the following command: Cluster <ClusterName> node <NodeName> /evict. In previous parts we looked into necessary procedures for preparing Active Directory and upgrading HUB/CAS/MBX roles (or single Exchange Server with HUB, CAS and Mailbox role installed) to Service Pack 2. In this part we will go trough necessary steps for successful upgrade of Exchange 2007 Cluster Continuous Replication (CCR) Cluster to Service Pack 2. Upgrading CCR Cluster to SP2 is different from upgrading non-clustered Mailbox Role to SP2 in many ways. Notice that in previous parts we were using both GUI and unattended mode but only option for cluster upgrade is using unattended mode. For the demo purposes we will use Active node named CN-CCR01, passive node named CN-CCR02 and exchange cluster named CN-EC01. 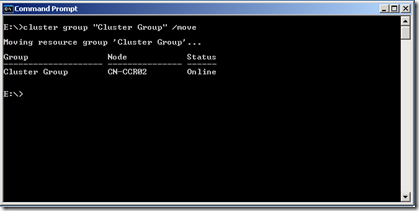 Move all Cluster Groups to active node (CN-CCR01). 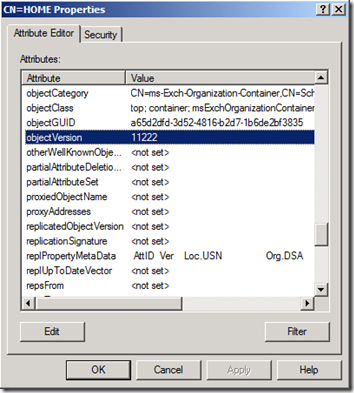 From command prompt run setup.com /m:upgrade from folder with SP2 setup files. After successful upgrade reboot Passive Node (CN-CCR02). 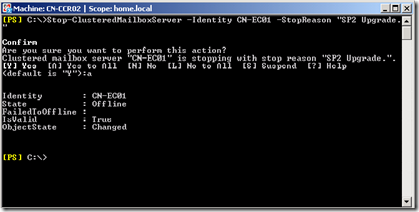 Stop-ClusteredMailboxServer CN-EC01 -StopReason "SP2 Upgrade." Use Move-ClusteredMailboxServer cmdlet to move the clustered mailbox server (CMS) from Active Node (CN-CCR01) to Passive Node (CN-CCR02). You must run this from Passive Node (CN-CCR02). 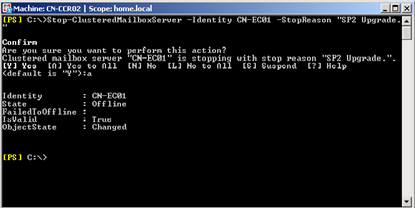 Move-ClusteredMailboxServer CN-EC01 -TargetMachine CN-CCR2 -MoveComment "SP2 Upgrade." From command prompt run setup.com /upgradecms from folder with SP2 setup files. 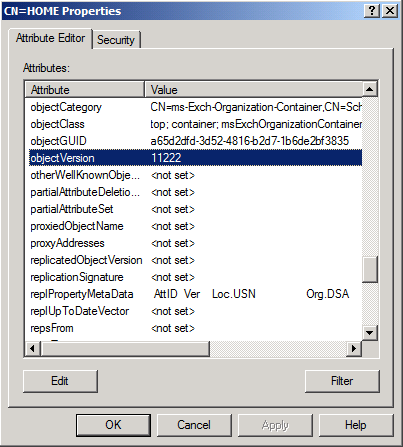 Move Cluster Group and CMS back to Active Node (CN-CCR01). 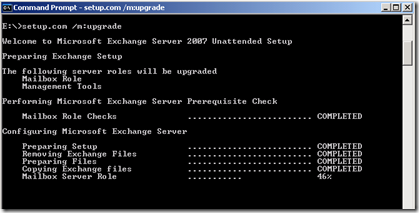 This is the second part of upgrading procedure for Exchange Server 2007 SP2. In the fist part we looked into necessary steps for getting Windows ready and Active Directory ready for Exchange Server 2007 SP2. In multi site environment upgrade site by site in the above order (not for example all Client Access Server across multiple sites! and than next role). Upgrade internet facing site(s) first. Before proceeding with SP2 installation make sure that any 3rd party application is compatible with SP2 (for example: antivirus software, backup software, archive software,…) and upgrade them if necessary. Run setup.exe from location with extracted SP1 files. If you know what you are doing, then click Install, otherwise PLEASE click Plan and read about Service Pack 2. After clicking on Install you receive window describing new features in SP1. Click Next and accept License Agreement. If all prerequisites are OK you can click Upgrade. Otherwise read carefully and resolve issues. Note: although screenshots are taken from installation on Edge server all steps are the same if you are installing it on non-clustered servers. Review installation steps and click Finish, if everything is OK. If there are errors or warnings, review and resolve them. I have seen some issues in the last month regarding repeated login prompts after installing Hotfix KB973917. Hotfix KB973917 is actually not a security Hotfix but it implements Extended Protection for Authentication in Internet Information Services (IIS). 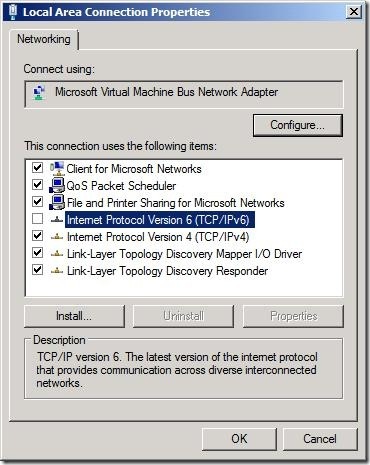 This article describes a non-security update that implements Extended Protection for Authentication in Internet Information Services (IIS). When Extended Protection for Authentication is enabled, authentication requests are bound to both the Service Principal Names (SPN) of the server to which the client tries to connect and to the outer Transport Layer Security (TLS) channel over which Integrated Windows Authentication happens. You can find many solutions in the wild – from uninstalling hotfix, enabling Kernel Mode Authentication on IIS Virtual Directories (Autodiscover, EWS, OAB and RPC). The real solution is installing Rollup 9 for Exchange Server 2007 SP1. As many of you probably know, Service Pack 2 for Exchange Server 2007 is one of the prerequisites for introducing Exchange Server 2010 into existing Exchange organization. Enhanced Auditing: New Exchange auditing events and audit log repository enable Exchange administrators to more easily audit the activities occurring on their Exchange servers. It allows the right balance of granularity, performance, and easy access to audited events via a dedicated audit log repository. This simplifies the auditing process and makes review of audited events easier by segregating audited events in a dedicated location. 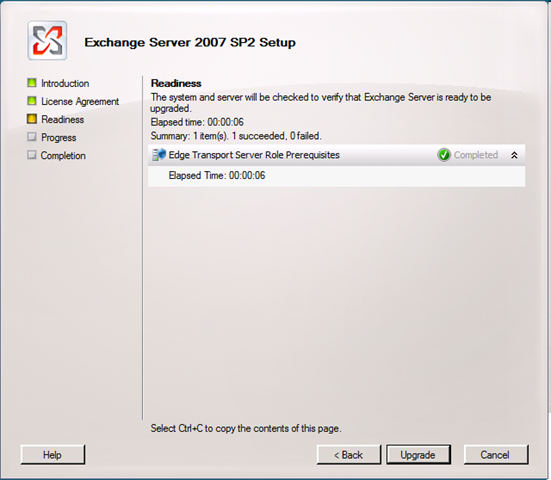 Exchange Volume Snapshot Backup Functionality: A new backup plug-in has been added to the product that will enable customers to create Exchange backups when a backup is invoked through the Windows Server 2008 Backup tool. 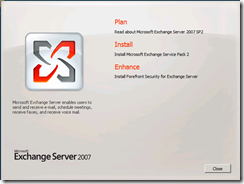 Exchange Server 2007 didn't have this capability on Windows Server 2008 and additional solutions were required to perform this task. Dynamic Active Directory Schema Update and Validation: The dynamic AD schema update and validation feature allows for future schema updates to be dynamic deployed as well as proactively preventing conflicts whenever a new property is added to the AD schema. Once this capability is deployed it will enable easier management of future schema updates and will prevent support issues when adding properties that don't exist in the AD schema. Public Folder Quota Management: SP2 enables a consistent way to manage quotas by improving the current PowerShell cmdlets to perform quota management tasks. Centralized Organizational Settings: SP2 introduces new PowerShell option that enable centralized management of many of the Exchange organization settings. 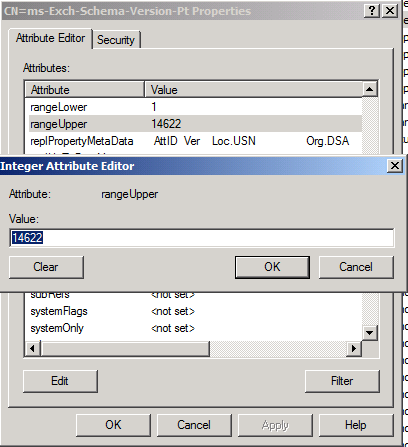 Named Properties cmdlets: SP2 enables Exchange administrators to monitor their named property usage per database. New User Interface for Managing Diagnostic Logging: SP2 enables Exchange administrators to easily configure and manage diagnostic logging from within the Exchange Management Console. I strongly recommend that you install latest Service Packs and hotfixes for your operating system and installed software. 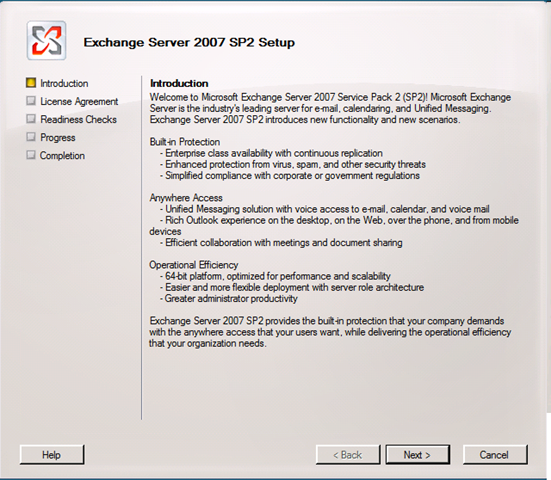 Please note that Exchange Server 2007 (SP2) is only supported on Windows Server 2003, Windows Server 2003 R2 and on Windows Server 2008. Windows Server 2008 R2 is not supported! 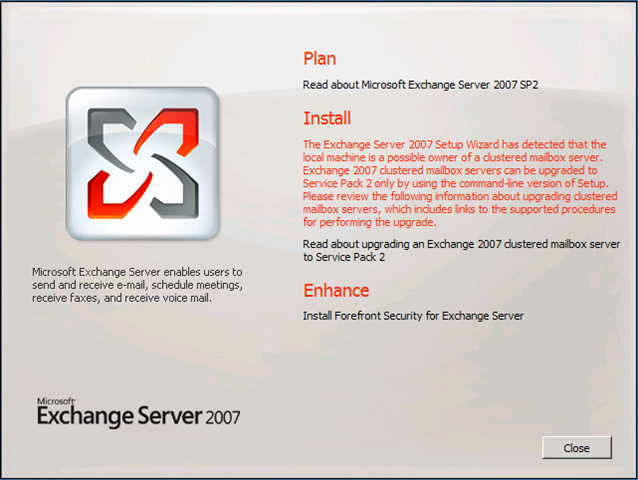 You need to deploy Windows Installer 4.5 on all target Exchange Server 2007 servers prior installing Service Pack 2. Please note that Windows Installer 4.5 is already included in Windows Server 2008 SP2 and Windows Vista SP2. 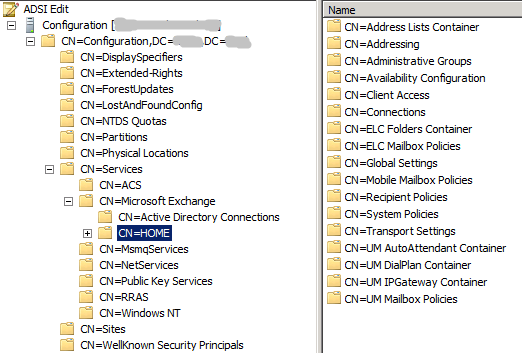 Backup Active Directory and Exchange! Please backup Active Directory and Exchange (especially Databases) before Active Directory preparation and Exchange Server 2007 SP1 installation. You should consider reading my previous blog post named Importance of good backups. Not all steps are necessary in simple Active Directory setup (single domain forest). 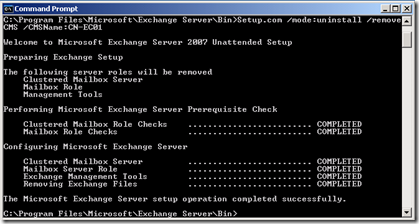 So here are necessary steps to prepare Active Directory for Exchange Server 2007 Service Pack 2. The advantage of running steps separately is that you can use account which has minimum permissions necessary for task. Run setup /PrepareSchema – You need to run this with domain account that is member of Schema Admins and Enterprise Admins security groups. Make sure that you run this commands from server that is in the same Active Directory Site as Schema Master DC. (Note: You must not run this command in a forest in which you do not plan to run setup /PrepareAD. If you do, the forest will be configured incorrectly, and you will not be able to read some attributes on user objects.). Run setup /PrepareAD - You need to run this with domain account that is member of Enterprise Admins security group. Make sure that you run this commands from server that is in the same Active Directory Site as Schema Master DC. In order to support the new Role Based Access Control (RBAC) model in Exchange Server 2010, a new security group is created inside Microsoft Exchange Security Groups OU named Exchange Trusted Subsystem. Run setup /PrepareDomain to prepare local domain, run setup /PrepareDomain:exlab.exchange.pri to prepare specific domain, run setup /PrepareAllDomains to prepare all domains in forest. Please note that /PrepareAD prepares current (local) domain during process. 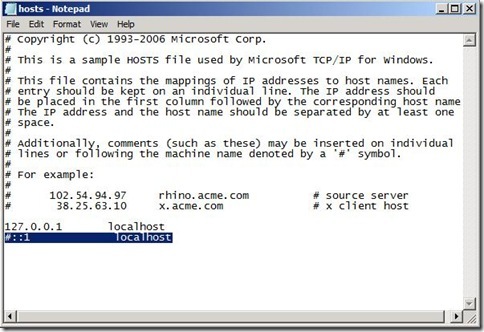 If you have single domain Active Directory forrest, running /PrepareDomain is not needed. 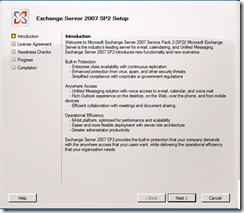 PrepareDomain in Exchange Server 2007 SP2 does not include ACEs introduced by Exchange Server 2010. After you run each command, you should wait for the changes to replicate across your Exchange Organization. It can take a while in large Active Directory site topology. You can always force replication via Active Directory Sites and Services MMC. 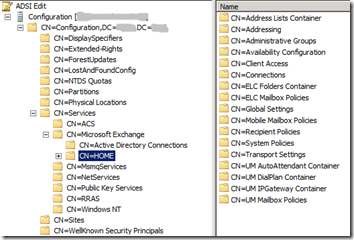 How do you verify successful preparation of Active Directory? Setup.com /PrepareSchema sets value of rangeUpper attribute of ms-Exch-Schema-Version-Pt to 14622 after successful finish. Setup.com /PrepareAD sets value of objectVersion attribute of <Organization Name> container to 11222 after successful finish. 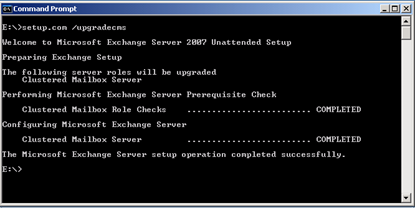 I noticed that some of the users are running Exchange Server 2007 Edge and public DNS Server on the same server. 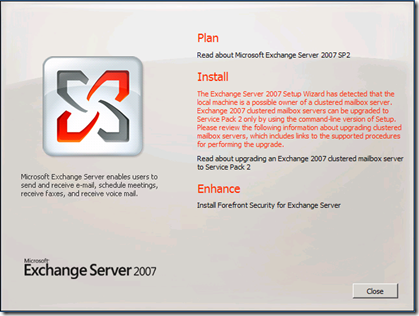 Exchange Server 2007, Exchange Server 2007 SP1, Exchange Server 2010 (Edge Role). Windows Server 2003, Windows Server 2008, Windows Server 2008 R2. DNS Server role is installed. 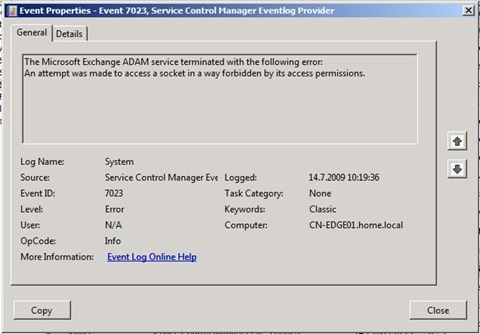 You receive following error and all Exchange services are stopped. If we take a look with netstat we can see that DNS Service (dns.exe) is using 50636 port. Exchange Server uses Active Directory Lightweight Directory Services (AD LDS), previous known as Active Directory Application Mode (ADAM), for storing Exchange (Organization)configuration. By default, the Edge Transport server uses the non-standard port 50636 for EdgeSync (Secure LDAP). We can check that with dsdbutil. Open cmd.exe, type dsdbutil and press Enter. Type list instances and press Enter. Issue is with hotfix KB951746 (MS08-037: Description of the security update for DNS in Windows Server 2008, in Windows Server 2003, and in Windows 2000 Server (DNS server-side): July 8, 2008). 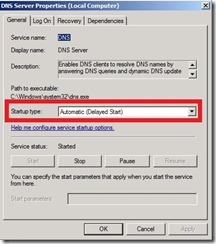 After security update KB951746 is installed on Windows Server 2008 (RTM/SP2), this issue occurs because the DNS server’s method of port allocation changes, and this change could prevent AD LDS from obtaining the port that it requires to function correctly. 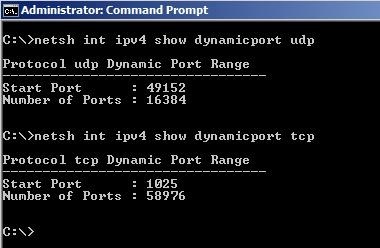 By default, after security update KB951746 is installed, the DNS server randomly allocates 2,500 UDP ports in the ephemeral port range. This is new behavior that is introduced by this update. A conflict may occur if one of these randomly allocated ports is a port that an AD LDS instance has to use. 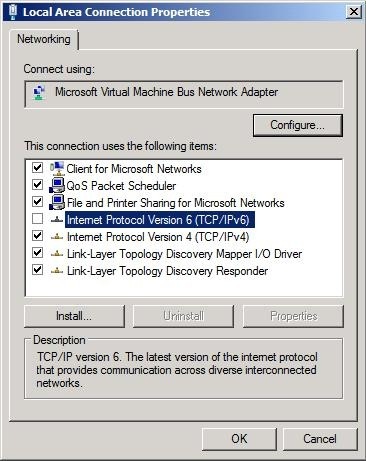 To comply with Internet Assigned Numbers Authority (IANA) recommendations, Microsoft has increased the dynamic client port range for outgoing connections in Windows Vista and in Windows Server 2008. The new default start port is 49152, and the default end port is 65535. We can check ephemeral port range in Windows Server 2008 witch netsh. This is a change from the configuration of earlier versions of Microsoft Windows that used a default port range of 1025 through 5000. 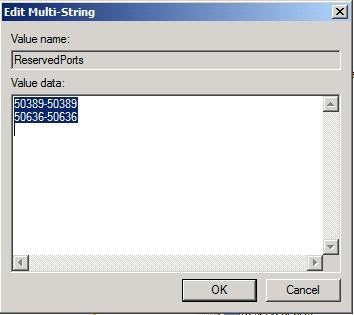 In Windows Server 2003 or in Windows 2000 Server, the value of the MaxUserPort registry entry defines the ephemeral port range. 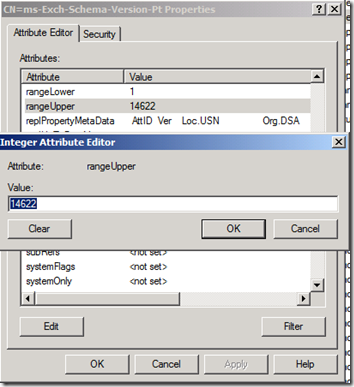 The range is from 1024 to the value that is defined by the MaxUserPort registry entry. If the value of the MaxUserPort registry entry is set, the ports are allocated randomly from the [1024, MaxUserPort] range. If the value of the MaxUserPort registry entry is not set, the ports are allocated randomly from the [49152, 65535] range. 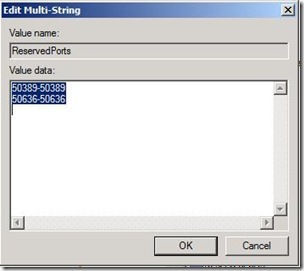 In Windows Server 2008 or in Windows Vista, the value of the MaxUserPort registry entry signifies the number of ephemeral ports. The range is from the [start port, start range + MaxUserPort]. The default start port is port 49152. Ephemeral port allocation occurs in the [49152-65535] port range before you install security update 953230 on Windows Server 2008. This port allocation behavior does not change after you install security update 953230. 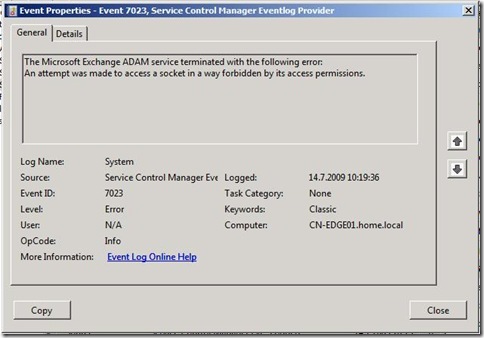 We need to reserve Ephemeral port range for Exchange Server 2007 Edge AD LDS instance. We need to specify reserved ports in registry. 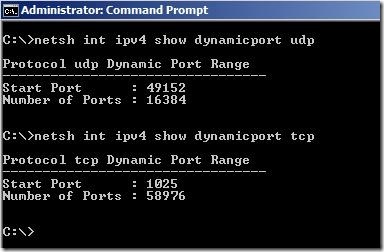 Although we can change port range in Windows Server 2008 there is simple trick that does the job. 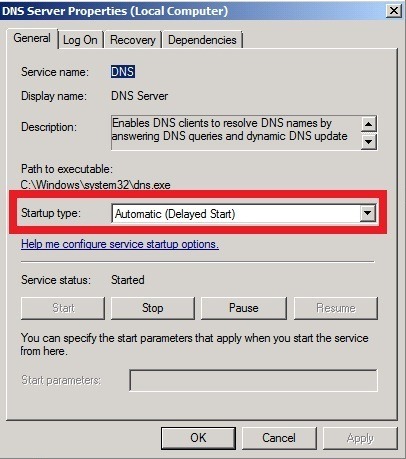 We can change DNS Server service startup type to Automatic (Delayed Start). Windows Server 2008 R2 DNS Server provides SocketPoolPortExclusionList that would allow us to exclude certain ports from DNS Server. 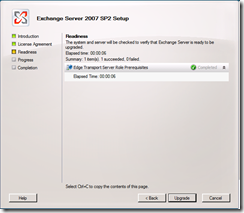 Exchange Server 2007 & Windows Server 2008 R2? 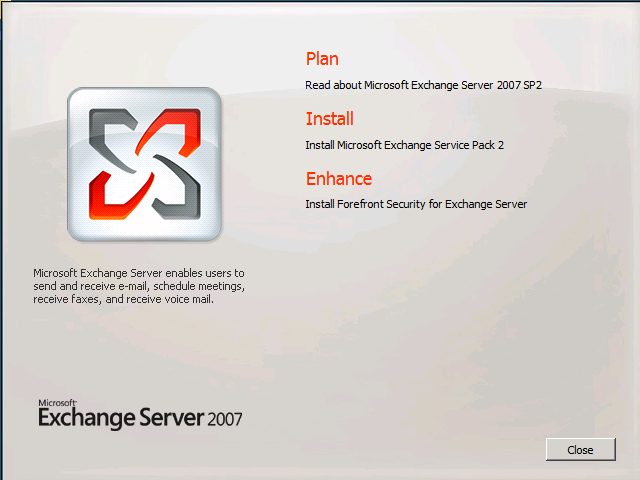 Microsoft today released the first public beta of upcoming Exchange Server 2010 (Code name Exchange 14). Microsoft Exchange® Server 2010 Beta helps IT Professionals achieve new levels of reliability with greater flexibility, enhanced user experiences, and increased protection for business communications. This software is intended for evaluation purposes only. You must accept the license terms before you are authorized to use this software. There is no product support for this trial software. You are welcome to participate in the forums to share your trial experiences with others and to ask for advice. Operating System for Installing Management Tools: The 64-bit editions of Microsoft® Windows Vista® SP1 or later, or Windows Server® 2008. If these required prerequisites are not already installed, the Exchange Server 2010 Beta setup process will prompt and provide links to the installation locations; Internet access will be required if the prerequisites are not already installed or available on a local network.